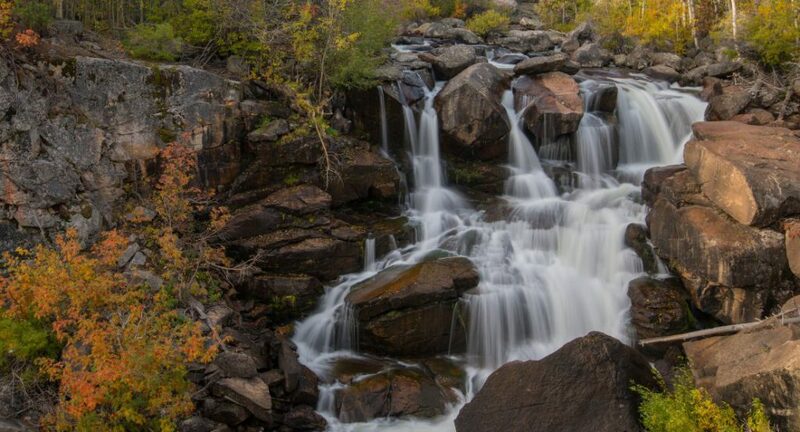 Popo Agie Falls, Shoshone National Forest. The Wind River and Absaroka Mountains are some of the most impressive in the country. Ask anyone who’s been here and they will tell you they are every bit as stunning as the Grand Tetons. Granite spires, dramatic peaks, and the highest peak in Wyoming: Gannett Peak at 13,804 feet. 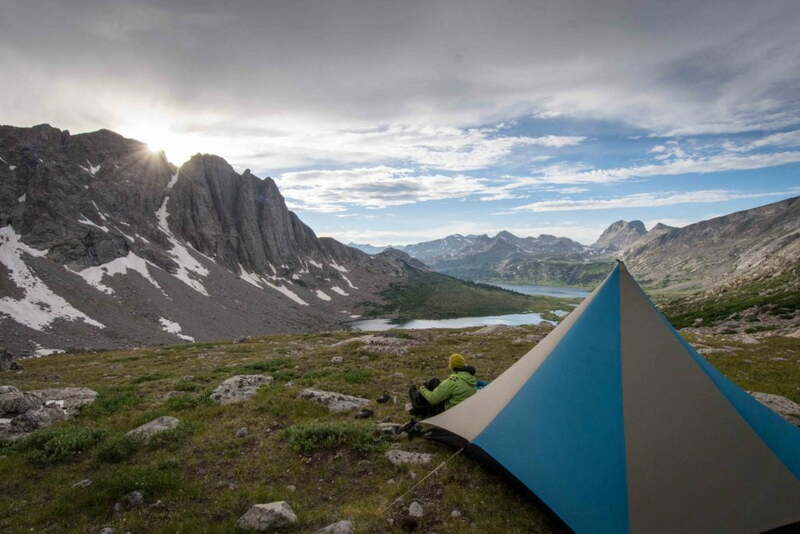 The Bridger and Popo Agie Wilderness areas are a backcountry paradise. 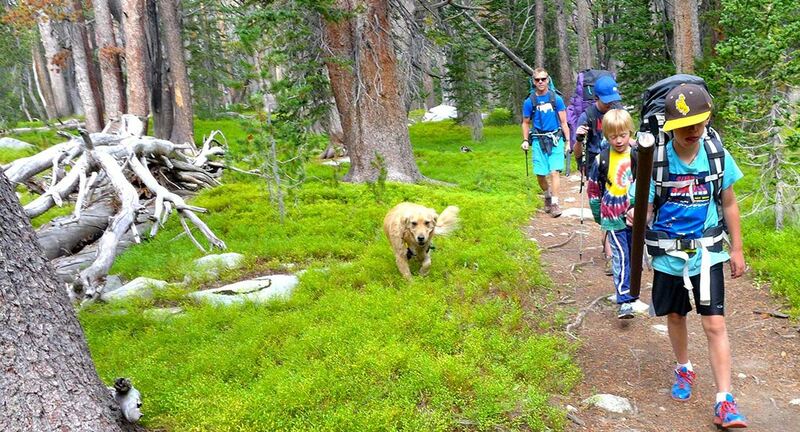 Explore it all on day hikes, lake trails, backpacking trips, and gentle nature trails. 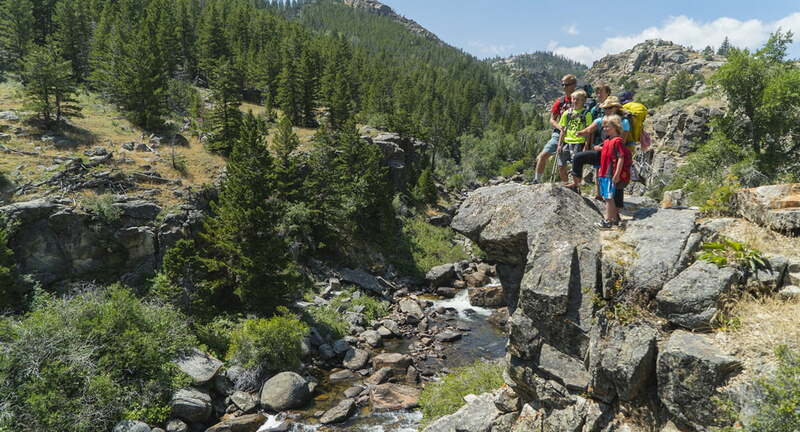 This is the quintessential Wind River Country hike. It follows the Middle Fork of the Popo Agie River through Sinks Canyon and after about 1.5 miles reaches a cascade of waterfalls. The trail head begins at the end of Sinks Canyon Highway 131, before the road begins to switchback up the mountainside. Park in the large parking lot named Bruce’s. Cross the highway and bridge and swing left on the trail. The well-developed trail is kid friendly. 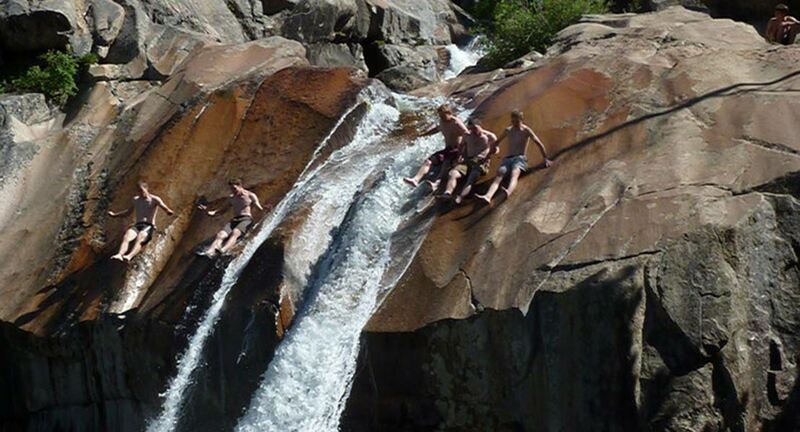 If you are feeling adventurous and the conditions are right, check out the natural waterslide at the falls. If 3 miles routndrip is not enough, this trail is a great starting point for other longer options into the Wind River Mountains. Lake Louise is often listed among Wyoming’s classic hikes. It’s a short hike, about 4.5 miles, that takes you through a variety of scenery. To get to the trailhead from downtown Dubois, drive on Highway 287 south about 5 miles. Turn right onto Jakey’s Fork Road at the Wyoming Game and Fish Hatchery sign. The road immediately forks—go left toward the conservation camp on Trail Lake Road. At the Wyoming Game and Fish Department sheep range sign, stay on the gravel road to the Conservation camp. The road, while navigable with two-wheel drive is full of rocks and is slow going. At the conservation camp, the road forks again. Go right toward the Glacier Trail. That will take you to a large parking lot, which is the starting point for Lake Louise, Whiskey Mountain and the Glacier Trail. You’ll start in a dry almost desert- like environment and climb to an alpine lake surrounded by high peaks, granite slabs, and cliffs. While this hike is short, it isn’t necessarily easy. It starts with steep switchbacks. Stay on the Glacier Trail until a sign directs you to Lake Louise. The trail is easy to follow but does involve walking in and around waves of granite. The last hundred yards require walking along a granite shelf. To reach this peak you’ll follow the same driving directions for Lake Louise and start at the same Glacier Trail trailhead. About half a mile from the trailhead, the trail branches. Follow it to the right (northwest) to go to Whiskey Mountain. While Whiskey Mountain is not a technical peak, it’s also not for the faint of heart. The summit is about 4 miles from the trail head and includes a 3,800-foot vertical ascent. The occasionally steep hike to the Popo Agie Falls can be a bit epic, especially for really young kids. If you still want to get out and explore Sinks Canyon, visit the Nature Trail. This relatively flat loop is about a mile long, but you can easily link it to other trails for something longer. It starts at the upper end of the Popo Agie Campground. As you are driving up Sinks Canyon, the turn off will be on your left and it will be the second turn off for the campground. The trail starts by crossing a fun suspension bridge. Interpretive signs along the way explain the area’s geology, flora and fauna. If you are looking for something a little longer, but still mellow, Christina Lake, at 8 miles roundtrip, is a great hiking option. Follow Forest Service Road 131 from Sinks Canyon up the switchbacks to the Christina Lake trailhead near Fiddlers Lake. The trailhead has parking, horse corrals, and public restrooms. At 1.8 miles into the hike, you’ll hit a signed junction. The Silas Lakes trail branches to the right and is a worth venture. If you continue on the Christina Lake Trail, which borders the Popo Agie Wilderness Boundary, it eventually intersects a 4-wheel drive road near Gustave Lake, where, especially on the weekends, you might encounter ATV enthusiasts the last half a mile to Christina Lake. The Rails to Trails pathway is used for biking, walking and jogging. It travels through town along the old railroad right-of-way and will take you to multiple monuments and historical markers. It’s a perfect family outing. From the trailhead in Riverton to the outskirts of town, the path is paved, but it continues on to Shoshoni as a dirt trail. Following the old railroad right-of-way, you can jump on the path at almost any cross street and go as far as you want for the day. It was hard enough rolling out of bed when the alarm blasted at a time so early in the morning, I thought it should still be considered night. I shoveled breakfast into my mouth and checked to make sure my backpack was fully stocked as my head cleared from the coffee I gulped between bites and pack additions. When I finally ventured outside, I was greeted with snow. A lot of snow. I drove through the deserted streets of Lander to the spot where I was to meet my companions. We decided to check out the trailhead, but as the snow deepened and continued to fall on our way up the road in Sinks Canyon, we finally decided the epic hike we’d planned wasn’t going to happen. But we didn’t lose hope. We voted to reconvene mid-morning, check conditions, and adjust our plans. What seemed like a lifetime later we met again. The snow was melting and the sun was shining, so we made a new plan to hike on the Middle Fork trail from Bruce’s Parking lot to Sheep’s Bridge, a round trip venture of about 12 miles. And that’s what makes Wind River Country great. You can decide mid-morning you want to get into the mountains and still get in 12 miles. There is a hike for every season, every ability, and every contingency right out your back door. In the spring when the trails near Lander are muddy, I can head to Dubois to explore the badlands. Each time they come into view I feel like I’ve entered another world, or at least another state. 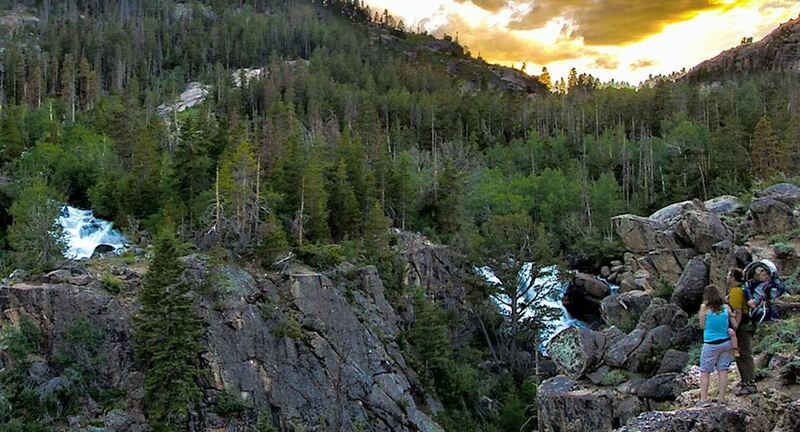 In the summer when the temperatures rise, I can escape to tree covered trails on the Shoshone National Forest. For a leisurely walk, or a short trail run, I often visit the Nature Trail in Sinks Canyon. In early summer the wildflowers explode in bright bursts of color, distracting me from my burning lungs unused to outdoor running. It’s a chance to get a mountain experience only minutes from town. 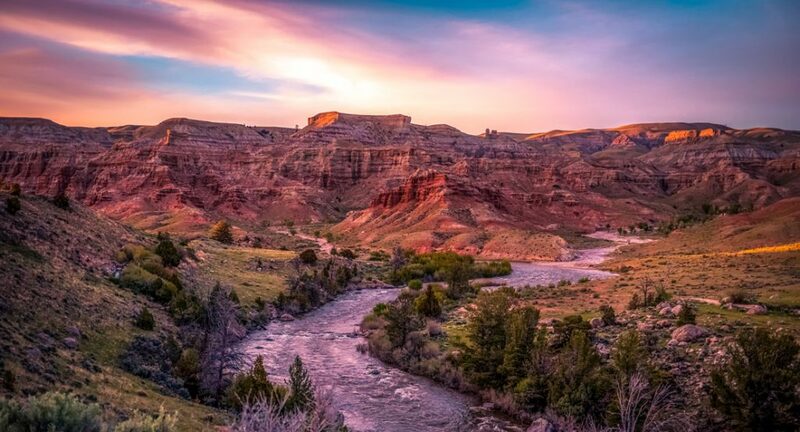 If you are looking for something with a historical twist you can walk parts of historic and famous trails, like the Oregon Trail and the Continental Divide Trail. There also are hikes with interpretive information. Visitors can get out and stretch their legs in Atlantic City and walking the path reading the interpretive signs and learning about the early days of Fremont County. Pick up a copy of the self-guided historical tour brochure. If you want some more distance, there are plenty of trips that will take you as long as your feet are willing to go. You can set out to visit mountain peaks, hidden lakes or desert landscapes. I learned early on when moving to Wind River Country that any type of hiking adventure I craved I could find. This area is blessed with a unique mix of topography: There are mountains to climb, high plains to traverse, and wild desert terrain to hike year-round. More than 500 million acres of public land means variety and plenty of space to find solitude. Yet I take every person who comes to visit me in Lander to the Popo Agie Falls in Sinks Canyon. With a roundtrip distance of about 3 miles, you get beautiful scenery as you follow the Middle Fork of the Popo Agie River. It’s easy for the physically fit and doable for visitors not yet acclimated to elevation. And it has an amazing pay-off for such a short distance. The falls are the start of the canyon proper and water cascades down several tiers of granite. Technically, the falls are a series of waterfalls and cascades, with the longest vertical falls reaching about 60-feet high. In the spring the falls roar and wildflowers line the trail. I still often hike the trail in the winter, relishing the quiet and marveling at how the water seems to freeze mid-cascade. In the summer, take water because much of the trail doesn’t have shade. But it’s still worth the sweat. The falls are still impressive even when the run-off is low and when the conditions are right, swimming pools form complete with a natural water slide. 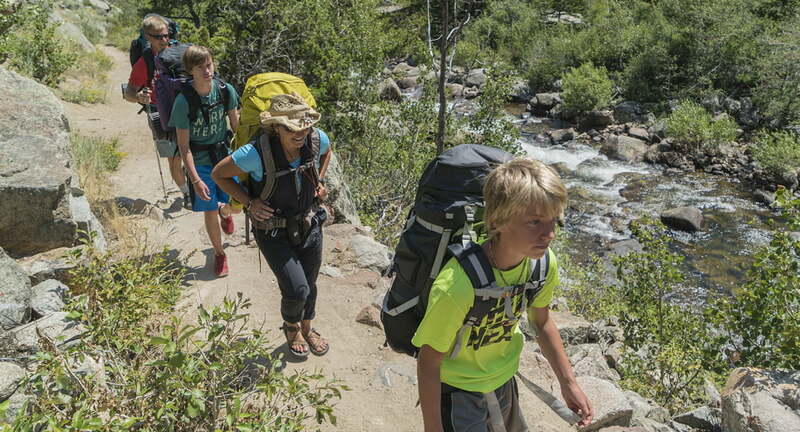 It’s the classic Wind River Country hike. 3577 US Hwy 26 W.